Get it? 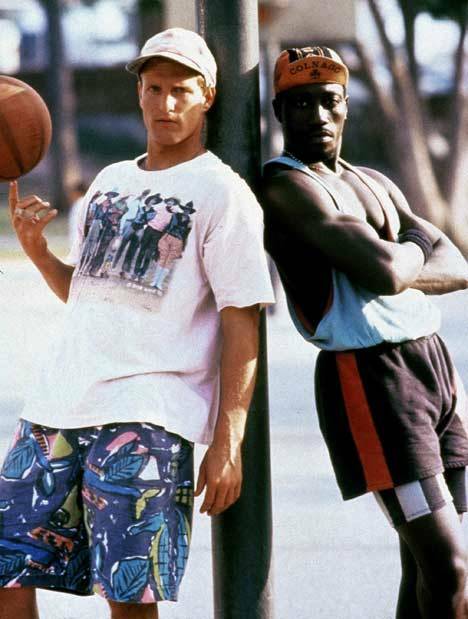 Fans of Woody Harrelson, Wesley Snipes, and/or the game of basketball know what I'm talkin' about. White chocolate and mint is a pairing I've done often--it's one of my favorites. I've brought it back again, this time in the form of cheesecake. The mint flavoring is so bright and refreshing, it really does a lot to lighten up the rich, creamy decadence that is white chocolate cheesecake. The green swirl on top is just for fun. In case you were wondering, my favorite thing about that movie other than all the awesome basketball being played was the attire. God bless the early 90s. Make the crust: In a small bowl, combine cracker crumbs and sugar. Then, stir in butter. Press onto the bottom and about 1 inch up the sides of a greased 9- or 10-inch springform pan. Bake 8 minutes, and then remove from the oven and cool completely. Make the cheesecake: In a large bowl, beat the cream cheese and sugar until very well blended, about 5 minutes. Beat in the flour and extracts until well blended. Add eggs and yolks. Beat on low speed just until combined. Stir in white chocolate and pour filling over crust. Add drops of food coloring along the top of the batter and swirl with a toothpick, if desired. Wrap pan in 3 layers of aluminum foil and place it inside another pan with high sides. Put the pan in the oven, and then add water to the larger pan so that it reaches about halfway up the sides of the springform pan. Bake for 45-50 minutes (longer for 9-inch pan) or until center is just set. Turn the oven off and leave the cheesecake inside for another hour. Remove the pan from the oven and cool on a wire rack for 10 minutes. Carefully run a knife around edge of pan to loosen. Cool 1 hour longer, and then refrigerate at least 4 hours, preferably overnight, before removing from pan. I'm not a big fan of minty treats, but I'm sure I'd love that wonderful cheesecake! your so cheeky with your titles....love it. Oh and I love the cheesecake too! I could have sworn you were not a cheesecake lover! I love the sound of this though. I love the idea of pairing mint and white chocolate. This cheesecake is so pretty as well. You always make me smile. The title was perfect, the cheesecake even more perfect. I've never had mint cheesecake before. It looks so pretty & tasty. Perfect for St. Patrick's Day. I agree with Leslie, your titles are the best. This cheesecake will be on my table for St Paddy's Day--- Thanks Grace! I'm not usually a fan of minty desserts but white chocolate cheesecake? Mmmmm can't say no to this! This would be great for St. Patrick's Day buffet table! Hermoso pastel de queso me encanta luce exquisito,abrazos y saludos. 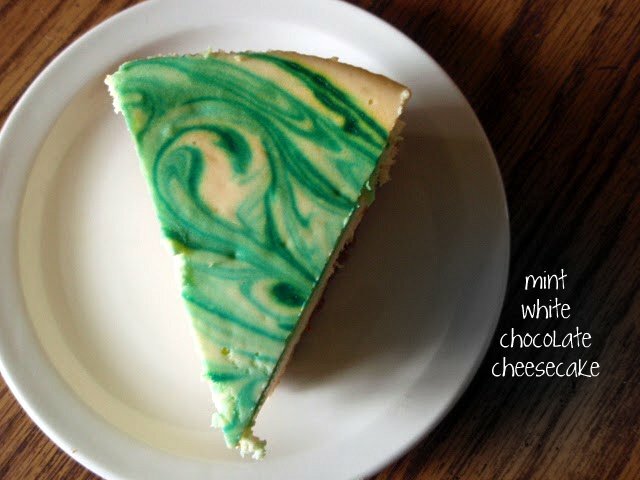 This cheesecake looks amazing, Grace!Love the green color and the mint flavor sounds interesting and delicious! Love the combo, Grace. Just not a fan of Woody Harrelson. Oh well, we can't all like the same movie stars. It'd be boring. I love the play on words with the title. This looks like a great recipe. This would be perfect for St Pat's--better than a Shamrock Shake! I love mint and these are so perfect for St Patty's Day! Congrats on your cupcake win too!! I am sure the mint gives this refreshing kick a white chocolate dessert needs! I love the swirl also! White man may not be able to jump but I hope that cheesecake can...into MY MOUTH. I love mint and chocolate together. (just posted a recipe for that, in fact). But I usually use dark chocolate. I've gotta give this a try. 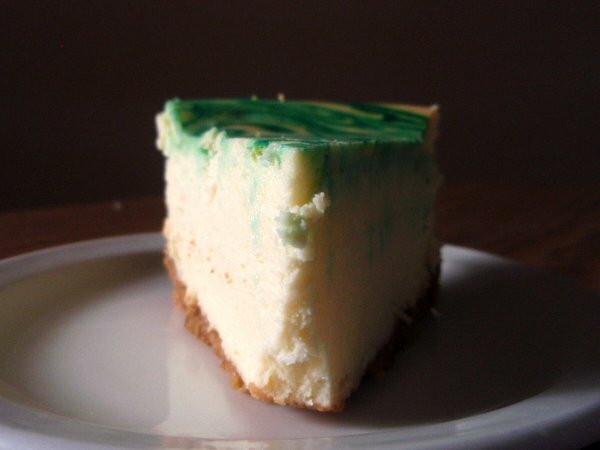 I love the pretty white with the gorgeous green in your cheesecake! Perfect for the upcoming St. Paddy's Day. The color is gorgeous! I am a huge fan of mint. Have I made a mint cheesecake?